Sherlock Holmes seems to be all the rage at the moment. A major studio film has been released, an anthology by John Joseph Adams, The Improbable Adventures of Sherlock Holmes has been published, and one of Fox's top shows, House, MD, has a number of connections to Arthur Conan Doyle's famed detective and sidekick. There's a new version out, one that's possibly the best version that I've yet to see: Steven Moffat's Sherlock. 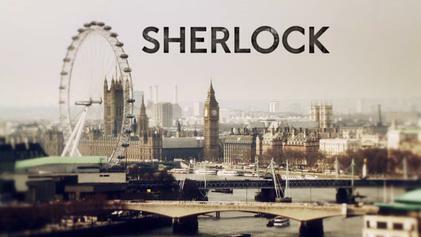 Set in contemporary London, the story of Sherlock Holmes has been reset to exist in the modern day. The titular Sherlock Holmes (brilliantly acted by Benedict Cumberbatch) is a self described sociopath, and a consultant for the London police. He's joined by John Watson (also brilliantly acted by Martin Freeman - who's also portraying Bilbo Baggins in the upcoming adaptation of The Hobbit), an Afghanistan war veteran who rooms with the troubled detective. The series, composed of three hour and a half long episodes, are amongst some of the best that I've yet to see in television. Where Hugh Laurie's House has allowed for a good update of the character, Cumberbatch's returns straight to the subject matter of crime and puzzles. Fortunately, there is a second series planned, although with Freeman's work on The Hobbit in a year, it would be interesting to see if there's an impact. The first episode, 'A Study in Pink' sees the meeting of Watson and Holmes amongst a rash of suicides in London as several people are found dead after taking a poisoned pill. As the two get used to one another, Holmes deduces that a single person is responsible for the murders, and works to track down their elusive prey. The second episode, 'The Blind Banker', sees a break in at a major bank, where nothing has been taken, but with a symbol spray painted to the wall of a secured office. As the two investigate, they move further into a world of international organized crime and Chinese gangsters. The last episode, 'The Great Game', sees Holmes locked in a psychological battle with his nemesis, Moriarty, with a series of challenges and crimes to solve in an ever shorter time period. It's worth noting once again that Benedict Cumberbatch owns Sherlock Holmes. His portrayal of the character is spot on, with more similarities to the modern adaptations of Laurie and Downey's own takes on the character, where he's psychologically tuned, observant, and socially clueless. Cumberbatch nails every element of his character, even if he looks more like Neil Gaiman in my own mind than what I've envisioned Holmes to be. It's curious that Holmes has popped up in a number of places lately. The stories have been incredibly popular throughout their publication history - Holmes is the most adapted character, ever - but it seems like he's popped up in a number of high profile areas lately. Sherlock did incredibly well on the BBC; a second series has been commissioned (and after the ending of Series 1, it's needed! ), while the film has spawned a sequel, which is due out in the next year or so. At the same time, House, MD, is well into its seventh year. Personally, I'm hoping that we'll see a House hallucination of the famed detective at some point. I think Holmes works well with any time period that he exists in. Doubtlessly, we'll see future adaptations of the character (I wonder how many science fiction stories have included him thus far), because the things that make him tick are really timeless. It's not the technology, the settings or backgrounds of Holmes, but the awareness of observation and superior cognition that he displays that fits everywhere. Add in a good look at the character and recognizing that it's not the hat and pipe that defines him, but the social ticks (the modern motion picture versions attribute Aspergers to the character, at least in part) that are more recognized in the modern day. Here, we see Holmes work well with cellular phones, city maps, computers and the like to solve his crimes. Moffat's Sherlock is one that's destined for recognition, and I hope that it'll become as recognizable as some of the other classic versions. It's a fantastic drama, and the next series will be well anticipated. It’s exceedingly well thought out, acted and shot, and represents the best of what television can do with a familiar character.